Atlanta's premiere sophisticated cocktail lounge and first of true local historical significance, has cultivated a new genre for Atlantans. Designed and built with reclaimed Georgia wood including oak, pine and cherry, gathered from over fifteen counties, antique iron and artifacts from the city's first cobblestone buildings, interiors swathed in rich decor and furnishings including relics circa 1845, Establishment pays tribute to the founding pioneers of the most relevant city in the South and founder of one of the world's most famous towns, Buckhead and Henry Irby. Establishment Recipe: one part cocktail lounge, one part museum, two parts iconoclast lifestyle, shaken vigorously and poured over the city of Buckhead. Cocktail curation is the name of Establishment's award winning beverage and ice program. Our drinks are cultivated with only fresh ingredients, uncompromising spirits, flames and flavor, all prepared over hand carved blocks of ice delivered daily. Linger over the city's best beverages, from Brambles to Bourbons, Gins to Rickey's, and whiskey and beer that are admired around the country. Imbibe and hear the legend of Henry Irby and the 12 point buck he shot and hung on a gas lantern to attract locals, eventually proclaiming, "meet me at the bucks head." Once the sun goes down, enjoy the best of Atlanta's world famous music scene with top DJs performing in a loft above the crowd. With special attention paid to the rich history and local relevance, Establishment commissioned one of the country's top new artists Janssen Robinson to bring 1845 Atlanta back to life through his oil on canvas paintings that adorn our 175 year old walls. Our patio is perfectly poised for afternoon spring drinks, sumptuous appetizers, business, romance, catching up and winding down. 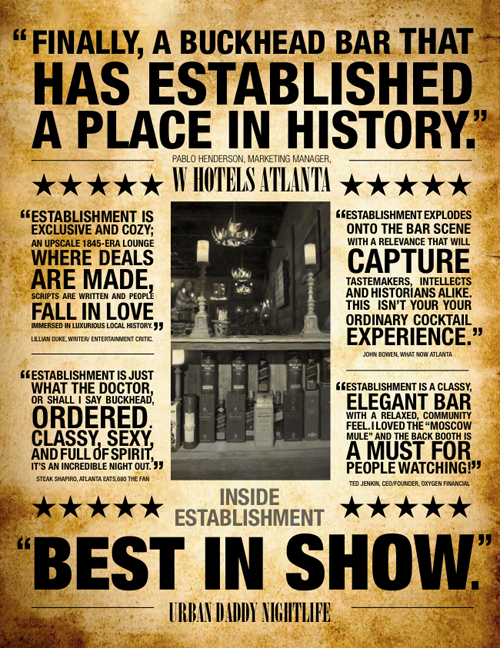 If you haven't experienced it, the time for appointment libations and a slice of Georgia history is right now.